Oh dear. Miss Thrifta-hoardaholic has been confined to the home due to circumstances I won’t disclose. But it’s Thrifting Thursday! Nobody said life was fair, so I must resort to trolling Craigslist (I know it’s not a new concept, but it’s still so durn fun). I find so many things on this site but I get hugely overwhelmed with how spread out the Bay Area is and the fact that there is gold EVERYWHERE. Because many of you live all over this vast land of techiegasm, I’m hoping that one day, ONE DAY, one of you will score one of my finds. I’d be ONE.PROUD.MAMA. Dear Furniture Gods: Please make this set appear somewhere in my house. I know space is limited, but I don’t care. This would shoot a highly concentrated dose of envy juice right up my vein for the lucky new owner. $75! 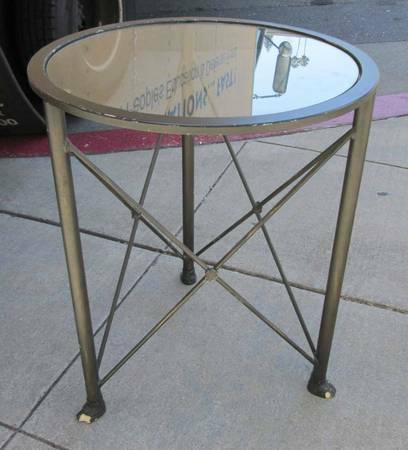 For the table and 4 chairs! I’m now 100% convinced of the 80’s comeback. 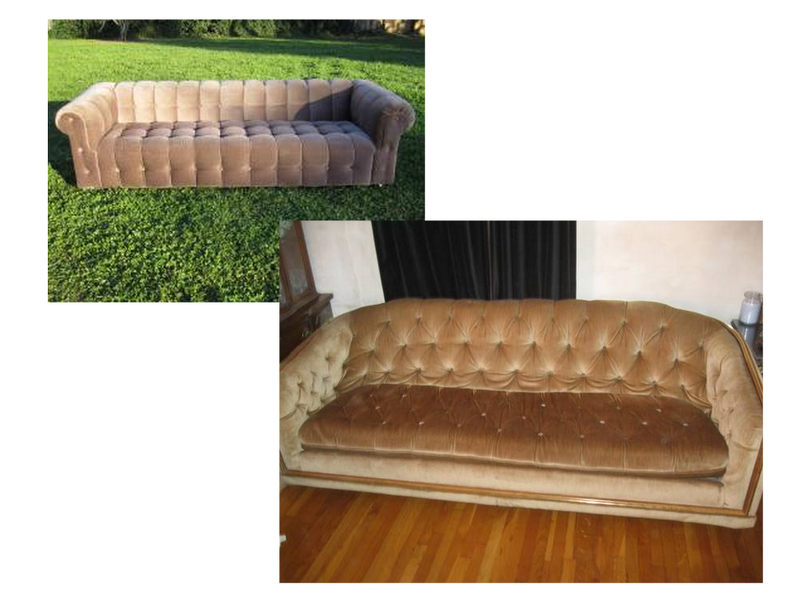 Not to beat a dead horse, but I WILL OWN A VELVET TUFTED SOFA one day. After seeing a few at Sally’s Army, I think the price is a little steep but it appears to be in really good condition. Me thinks $250/$300 would be a fair deal. That’s more like it. This looks exactly like the free one I saw on CL not too long ago, except in gold. 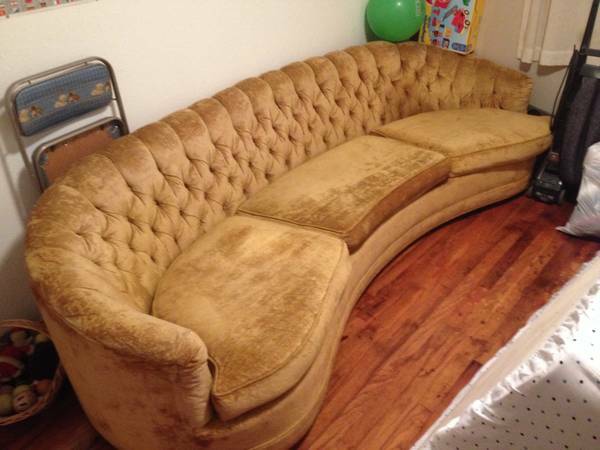 It has an 80’s flair to it with its wood trim. I love its gondola’ish curved feel. I’d definitely offer $200. Check out the curves on this hottie! I like curves. However, it’s located in Placerville. If you’re going to drive all the way out there, presumably with a U-haul, offer $100 for your troubles. 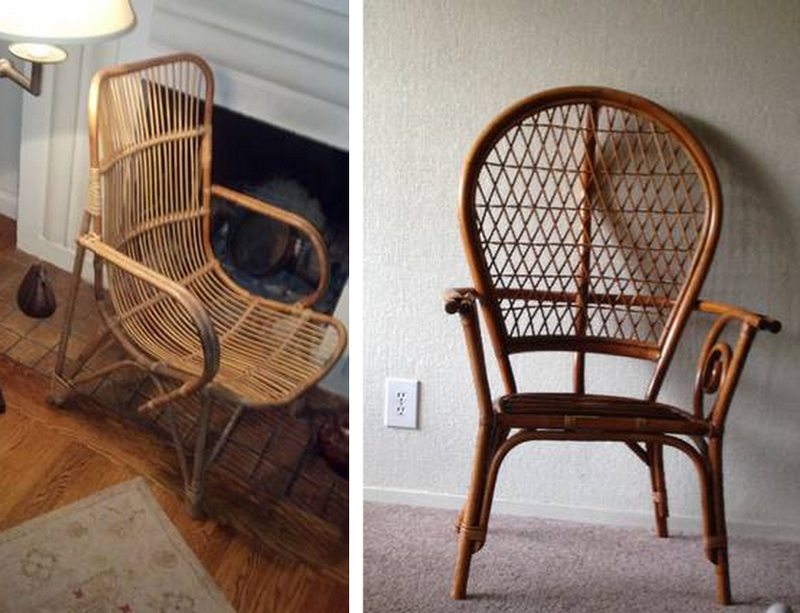 Something wicker this way comes. Here’s a cutie I’ve always wanted. These chairs are red hot items on Chairish, and I’ve been on the lookout for a deal. However, being that I just hoarded one at Sally’s, I’ve imposed a chair buying moratorium on myself for a while (yeah, right). I think the price is a wee bit steep for Craigslist, but a good deal in comparison to other retailers. 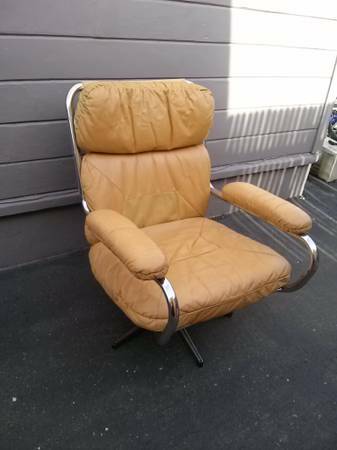 Not quite the grand peacock chair that’s so highly sought after, but for $35, I’d take this baby home and throw a sheepskin on it. In the interior design world and fah-fah-fah French, we call this an étagère. My Chairish colleague and thrifting cohort Erin brought this beauty to my attention. Insanity. Wickerific. Someone own it, pleeeeeeze! Hard to believe that anything faux could be so popular, but this stuff is super duper trending right now. 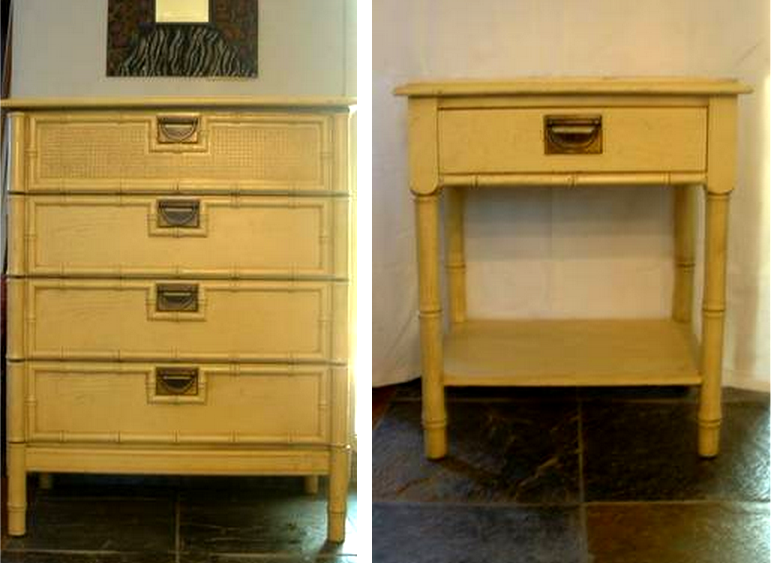 The price is great, and it’s neutral enough for any style of room, in any color. I’d paint the walls a deep royal blue and accessorize with bright kelly green goodies. Place one white orchid plant on top of that dresser and there you go with your eye candy vignette. Faux sure. 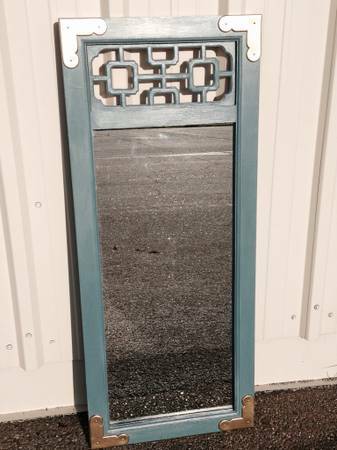 Cute little mirror, Chinoiserie style with campaign accents. I’m guessing the owners refurbished it and added the hardware, which is brass/gold. The price? TOO MUCH! I’d pay no more than $100. If it weren’t so far away, I’d convince the hubs to get it for our hallway to cover up our electrical box. I’m crushing on the base. It’s Eames Eiffel base chair‘ish. Remove the glass, spray paint it with a fresh coat of brass or copper, and set it beside your velvet tufted sofa with a white ceramic base lamp. Yes, it’s tired and worn, but I think every space should have a really lived-in piece of furniture to add charm and character. I’m all about imperfection. A space that looks too polished and perfect frightens me away. I love leather accent chairs in the Knoll/Eames style. I wouldn’t pay more than $100 for this baby, but I find myself looking at it over and over again. Extra seating, in pink! I see these leather poufs in so many interiors and on Pinterest right now. I’m jonesing for one in a tan or dark brown leather. $75 seems high but it’s actually on the lower end of what I’ve seen out there. 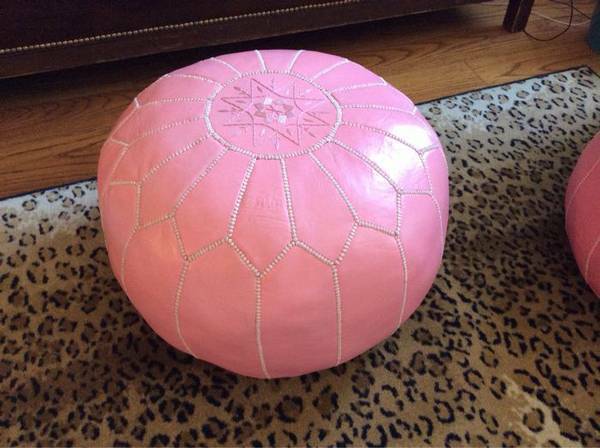 And who wouldn’t want to say “Take a seat on my pink pouf? ?” I know I would. Offer $40-$50. That pretty much does it. There’s so much more, but none worthy of posting (it’s gettin’ pricey up here in the Bay!). 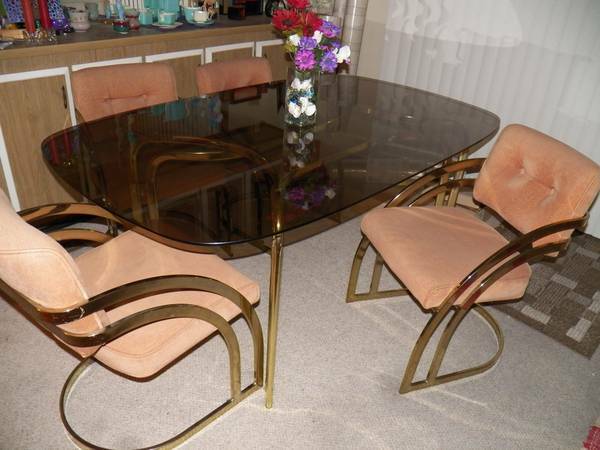 I came across these chairs that gave me major eye bonerz but they are simply too much money, even though they’re far more affordable than paying retail. 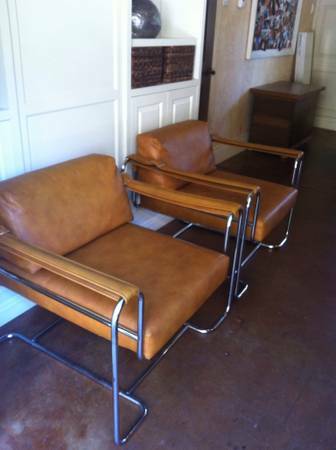 I think it’s definitely on my radar to own a pair of gorgeous tan leather chairs one day. I have my eyes on these and these, but because a self-imposed chair buying moratorium just went into effect AND I’ve never been known to pay more than $20 for a chair, I must let go and assume the fetal position. « Look ma! I got nominated for a Liebster! You’re right about the lived in style (MCM leather chair). I’d totally offer $100! It would really be one of those welcoming pieces. It’s such a handsome chair. I think it’s totally worth $100! I seriously love the pink pouf! I love it too. You almost need a pair of them! These are really great finds and I love your blog. I have nominated you for a Liebster award if you’d like to check it out. Do you ship? I want the etagere!!! Hi Renee! These are not my things that I’m selling. I find stuff on Craigslist that I think are good deals on popular items. 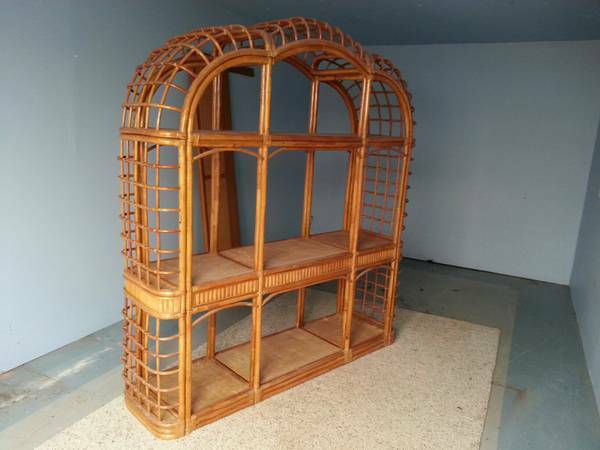 Click the links under each item and you’ll be taken to the listing where you can purchase from the seller on Craigslist (if they are still available). Thanks so much for reading and commenting! That etagere is FAB. You have great taste!